Embryonic stem cells (ES cells) have been a fundamental resource in gene engineering and regenerative medicine. It has been known that various transcription factors play crucial roles in the regulation of pluripotency of ES cells. Time lapse analysis in live cells has provided essential information regarding the temporal regulation of such pluripotency regulators. For example, a recent long-term single-cell tracking study in monolayer ES colonies revealed the less stringently implemented interactions of pluripotency regulators than assumed based on previous studies*1. It has been considered that the interactions between a cell and its surrounding neighbors are also an important determinant to regulate the expression of pluripotency regulators. Therefore, analyzing the cellular behaviors in three-dimensional (3D) culture systems, which can mimic the actual in vivo environment more closely than traditional monolayer cell cultures, is an indispensable strategy to assess the regulatory functions in ES cells. Here we report 3D time lapse analysis of the expression of Nanog, a critical pluripotency regulator, in cultured mouse ES cell colonies using Yokogawa’s all-in-one confocal image cytometer CQ1. A knock-in ES cell line, in which a Nanog allele was targeted with enhanced green fluorescent protein (EGFP) at the translation start site (Nanog-EGFP) and histone 2B-mCherry fusion protein (H2B-mCherry) was forcibly expressed, was created. ES cells were cultured in DMEM supplemented with 20% fetal bovine serum and 1,000 U/ml LIF on mitomycin C-treated mouse embryonic fibroblast feeder cells. Time lapse imaging (48 hours, 30 min interval, 40x objective lens , 2 fields) was conducted in CQ1 equipped with an forced-humidified internal incubation chamber to control the temperature and the concentration of O2 and CO2. Fig. 1. Measurement of Nanog-EGFP expression in individual cells in ES cell colonies. (A) Time lapse maximum intensity projection (MIP) images of ES cell colonies. Four colonies at the beginning of the experiment (arrows) gradually fused each other and became a large colony. (B) Z stack images of this colony at 48 hour in culture. Green and red outlines indicate the Nanog-EGFP-positive and -negative cells recognized by CQ1, respectively. (C) Scatter plot of the fluorescence intensity of Nanog-EGFP and H2B-mCherry of individual cells in the colonies in (A). (D-G) Temporal change of the volume of the colonies (D), number of cells in the colonies (E), ratio of Nanog-EGFP-expressing cells among cells in the colonies (F) and the amount of Nanog-EGFP in the Nanog-EGFP-expressing cells (G). Bars with different colors represent different colonies in (A). (H) Time lapse movie (Selected). Fig. 2. Distribution of Nanog-EGFP expression in a ES cell colony. (A) Inner and outer compartment of the colony. (B) Percentage of the number of Nanog-EGFP-expressing cells to the total cell count in the inner and the outer compartment. (C) Amount of the expression of Nanog-EGFP in the Nanog-EGFP-positive cells in the inner and the outer compartment. The expression of Nanog-EGFP in individual cells in a colony of a Nanog-EGFP knock-in ES cell line was quantified by 3D time lapse live cell imaging. The expression Nanog-EGFP increased with time and the expression level of Nanog-EGFP seemed different between the inner and the outer compartment in a colony examined. Time lapse live cell imaging combined with single-cell tracking and/or cultures with microfluidics would be useful to reveal the detail of the regulation of pluripotency in 3D environments. This study was conducted under the supervision of Prof. Horie, Nara Medical University, on the responsibility of Yokogawa Electric Corporation. Reference : *1. Filipczyk et al., Nat Cell Biology 17, 1236-1246 (2015). We post our information to the following SNSs. Please follow us. CellPathfinder is designed for our HCA systems, CQ1 and the CellVoyager series. From beginners to experts, the analysis software lets you quantify subtle physiological changes and even label-free samples with various graph options. 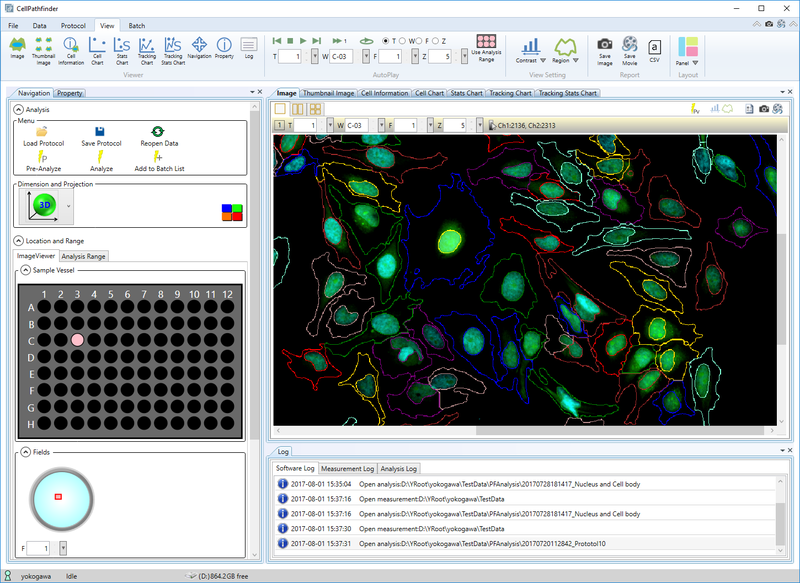 Our high-content analysis systems utilize powerful analysis software to address a range of research applications from basic science to drug discovery screening. 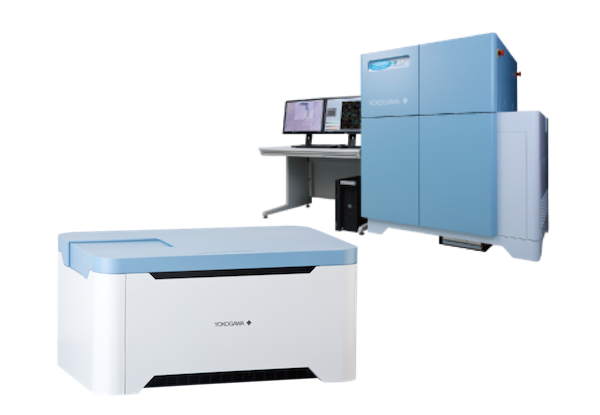 Yokogawa’s high content analysis systems and dual spinning disk confocal technologies provide high-speed and high-resolution live cell imaging, enabling leading-edge research around the world.